Downstairs master? Check. Best neighborhood in Williamson County? Check. Wonderful amenities? Ditto. This Westhaven charmer, located at 320 Starling Drive, has it all. Within its 3461 square feet, you’ll find a beautiful custom floor plan and too many upgrades and extras to mention. But we’ll try. 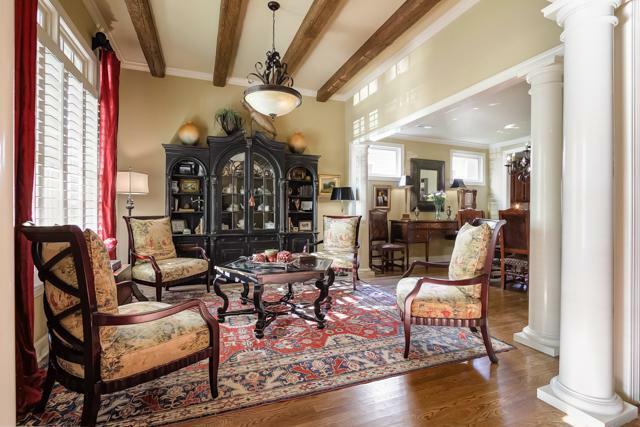 With elegant French cottage style architecture, this home is unlike any other in west Franklin’s popular Westhaven. The attention to detail and quality starts at the welcoming front porch and keeps coming. Once inside, you step into a wide corridor that opens to all of the main floor entertainment, living and kitchen areas that blend an open floor plan concept with traditional architecture. The formal living room features 11-foot beamed ceilings that create drama and warmth. A large window brings in wonderful natural light and the hardwoods here flow throughout the main floor. The large dining room can be full-on formal or dressed down, depending on your lifestyle. The two rooms are well defined yet flow into one another, providing a space for both intimate and large-party entertaining. A beautiful copper table with barstools is a unique alternative to the traditional kitchen island and you’ll love its versatility. It’s perfect for food prep, casual family meals and provides a large buffet space for casual entertaining. Surrounding the table, which stays with the house, are beautiful and abundant mission-style cabinets with gleaming granite countertops, an all-stainless suite of appliances, including a double oven and gas cooktop, a stone and tile back splash and a large pantry. The kitchen opens to the cozy family room and breakfast area. Here you’ll find a beautiful gas fireplace, lots of windows and access to the covered porch that opens to the private courtyard. The master suite is accented by a deep tray ceiling with a bronze chandelier. New hardwood floors, plantation shutters and room for a sitting area make this private space even more inviting. The master bath has two large Brazilian granite-topped vanities, premium fixtures, a deep soaking tub, a separate shower, his-and-her master closets and generous storage space. A custom-designed home office/library features a wall of built-in bookshelves with work space. New hardwoods have also been added. A large closet and adjacent full bath mean this space can easily transition to a bedroom or guest room if needed. The upstairs bonus room is a warm and welcoming space that’s great for a media room, office or play area. The custom drapes here, and throughout the house, remain. Outdoor entertaining is easy in your private courtyard featuring landscape lighting, a fountain, sprinklers and gates. The covered porch has room for outdoor dining and will be a favorite spot three seasons of the year, made more comfortable with the ceiling fan. The oversize double garage has built-in storage cabinets and work surfaces. The epoxy floor looks great and is easy to clean. The extra fridge here stays, too! Zoned for Pearre Creek Elementary, Hillsboro Middle and Independence High schools, this home is listed at $609,000 and won’t last long. To arrange a viewing or for more information, contact listing agent Matt Magallanes with Southern Land at 615-483-7547.